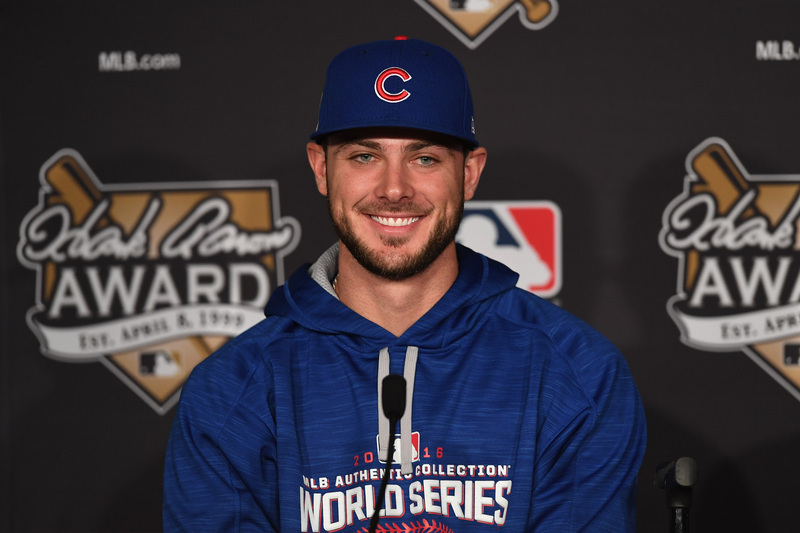 Over the past three years, Cubs third basemen Kris Bryant has become beloved by Chicagoans — and in Game 5 of the World Series, he made history as the youngest Cubs player to hit a long ball during a World Series game in over 80 years. According to NBC Chicago, the 24-year-old is a strong contender to receive National League MVP honors at the end of the season. The 2016 World Series has put him in the national spotlight and, as his star rises, fans are no doubt clamoring to know more about his personal life. For example, who is Kris Bryant's fiancée? In December, Bryant announced on Twitter that he and Jessica Delp were engaged. Accompanied by a photo of the couple, he wrote: "Only took me 8 years, but I can't wait to marry my best friend! Perfect way to end an unforgettable year!" Delp also took to Twitter to share the good news and captioned her photo: "Thankful for that cute boy 8 years ago that asked me out & now I get to call that man my fiancé." According to an interview Delp did with Chicago Splash, the pair began dating when they were sophomores at Bonanza High School in Las Vegas — reportedly, both had to be dropped off by older siblings and friends because they weren't old enough to drive. In June, the couple adorably donned matching Cubs jerseys and had their engagement photos taken at (where else?) Wrigley Field. Although they've been a couple since high school, Bryant and Delp successfully managed a long distance relationship during college. According to Heavy, Delp attended University of Nevada - Las Vegas, where she earned her degree in psychology. After graduation, she hit the road with Bryant and the couple currently live in downtown Chicago, where Delp is involved in a number of charities. Chicago Splash reported that she's close friends with the significant others of other Cubs players, and they work with Cubs Charities on events and fundraising. Delp recently visited Maryville Center for Children to spend time with the patients and bring them gifts. It's a whole lot colder than Vegas, but Delp seems to love Chicago life. Delp played sports in high school and, judging by her Instagram, she still loves exercise, especially during those beautiful Chicago summers. Delp has amazing an amazing sense of style (seriously, fashion lovers — start following her on Instagram STAT) and she has perfect ballpark outfits. Starbucks and donuts are integral to her afternoon routine — so she's definitely wise. As Chicago Splash noted, she's super close with the wives and girlfriends of the other Cubs players — and they threw her a beautiful bridal shower at the field in September. I can't wait to see those wedding photos — Bryant and Delp are too cute together and I'm willing to bet her dress will be amazing.